Swiss stamps for use on Air Mail letters during this period featured a new definitive Air Mail stamp set, commemorative Air Mail stamps, Air Mail stamps for noteworthy first flights, and the debut of the first PRO AERO Air Mail stamps. The overprinted and re-valued Air Mail stamp shown above was issued on May 22, 1938 to promote the Pro Aero Campaign, held throughout Switzerland from May 21 through May 22, 1938. These Swiss stamps (Zu. F #26, Mi. #325, Sc. #C26) were printed in miniature panes of twenty-five, which were available with favor-cancellations applied to them. On May 22, special Air Mail flights were made to thirteen Swiss cities, with the letters being franked by the stamp shown above. The proceeds from the sale of the stamps were SFr. 139,083. Combined with other donations, the total contributions for the two day campaign netted the foundation SFr. 632,000, a very large sum of money in 1938. Unused stamps were not sold to the public in the usual manner. They were affixed to Air Mail letters by the postal clerks, when the stamps were purchased at the post office. Mint condition examples, however, DO EXIST in the philatelic marketplace, but they are tremendously rare, with a mint, never hinged example being about $15,000. Quite a few of the so-called "mint" examples offered are actually "un-canceled" examples that have been soaked off of flight covers, with a "flown cover" being valued at only about $15. The eight definitive Air Mail stamps shown above (Zu. F #27-34, Mi. #387-94, Sc. #C27-34) were issued on May 1, 1941. These stamps could be used on ANY Air Mail letters or packages, and they remained valid for general postal usage until December 31, 1955. 50 C. - Lake Geneva. 60 C. - Alpstein Mountains. 01 F. - Lake Lucerne. 02 F. - Engadine Valley. 05 F. - Churfirsten Mountains. The 30 C. and 40 C. denomination landscape-type definitive Air Mail stamps were re-issued on October 1, 1948, with their original colors being reversed. They are both shown in the scan above (Zu. F #43-44, Mi. #506-07, Sc. #C43-44). The overprinted landscape-type Air Mail stamp shown above, at the left (Zu. F #35, Mi. #395, Sc. #C35), was issued on May 12, 1941 to promote the Pro Aero Campaign. These stamps were on sale between May 12 and May 28, but they were only valid for mail carried on the Buochs to Payeme round-trip flight on May 28, 1941. The overprinted Pro Patria stamp shown above, at the right (Zu. F #36, Mi. #422, Sc. #C36), was issued on July 13, 1943 to promote the Pro Aero Campaign and to commemorate the 30th Anniversary of the First Alpine Flight by Oscar Bider on July 13, 1913. These stamps were on sale between July 1 and July 13, but they were only valid for mail carried on a special round-trip flight from Bern to Zurich on July 13, 1943. The four Swiss stamps shown above (Zu. F #37-40, Mi. #435-38, Sc. #C37-40) were issued during September 1944 to celebrate the 25th Anniversary of Air Mail in Switzerland. 10 C. - Haefeli DH-3 biplane. 20 C. - Fokker FVII monoplane. 30 C. - Lockheed Orion airliner. 1.50 F. - Douglas DC-3 airliner. The 2.50 F. denomination Air Mail stamp shown above (Zu. F #42, Mi. #479, Sc. #C42) was issued on March 17, 1947 to publicize the First Swissair Flight from Geneva to New York City on May 2, 1947. The design features a Swissair Douglas DC-4 between views of Geneva and New York City. 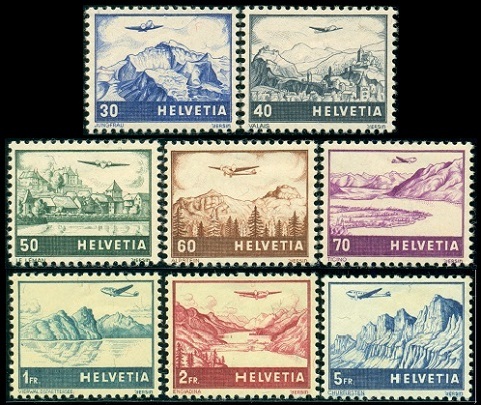 These Swiss stamps were on sale from March 17 through May 17, 1947, but they were only valid for postage on letters carried on the May 2, 1947 round trip flight from Geneva to New York City. The Pro Aero Air Mail stamp shown above, at the left (Zu. F #41, Mi. #470, Sc. 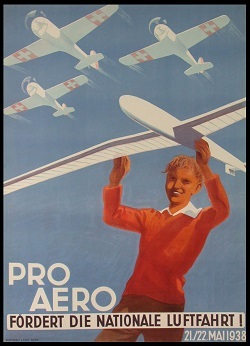 #C41), was issued on May 1, 1946 to promote the Pro Aero Campaign. The design features a Zögling Training Glider. These stamps were on sale between May 1 and May 15, but they were only valid for mail carried on special flights to Lausanne, Lucerne, and Locarno on May 22 and May 23, 1946. The Pro Aero Air Mail stamp shown above, at the right (Zu. F #45, Mi. #518, Sc. #C45), was issued on April 11, 1949 to promote the Pro Aero Campaign. The design features a Glider. These stamps were on sale between April 11 and April 27, but they were only valid for mail carried on special flights to Chaux-de-Fonds, St. Gallen, and Lugano on April 27 and April 28, 1949. The 2 F. denomination Pro Aero stamp shown above (Zu. F #46, Mi. #968, Sc. #C46) was issued on June 1, 1963 to commemorate the 25th Anniversary of the Pro Aero Foundation and to commemorate the 50th Anniversary of the First Alpine Flight by Oscar Bider on July 13, 1913. These stamps were on sale between June 1 and July 13, but they were only valid for postage on letters carried on special Pro Aero anniversary flights to Bern, Locarno, and Langenbruck on July 13, 1963. Many of the Swiss Air Mail stamps issued after 1938 are inscribed "PRO AERO", and they were issued specifically for Pro Aero fundraising campaigns. The Pro Aero Foundation of Switzerland was formed in May 1938, under the umbrella of the Swiss Aero Club. The aim of the foundation is to stimulate enthusiasm for aviation among public authorities and institutions and among young people. Their motto is "A nation that does not fly will be left behind". The Pro Aero Foundation raises funds for education and training in general aviation. They have aggressively promoted powered flight events, glider flight events, AND EVEN model airplane flying! The 2.00 + 1.00 F. denomination Pro Aero Air Mail stamp shown above (Zu. F #47, Mi. #968, Sc. #CB1) was issued on February 17, 1972 to commemorate the 50th Anniversary of the First Swiss International Commercial Flight and the 25th Anniversary of the First Swiss Trans-Atlantic Commercial Flight. These stamps were valid for all types of mail. Their use was obligatory on letters carried by special Pro Aero flights during May and June of 1972. 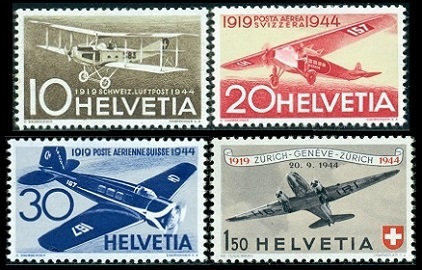 The surtax on these stamps benefited the Pro Aero Foundation and the Swiss Air Rescue Service. The 2.00 + 1.00 F. denomination Pro Aero Air Mail stamp shown above (Zu. F #48, Mi. #1196, Sc. #B479) was issued on March 9, 1981 to commemorate the 50th Anniversary of Swissair Airlines. The design shows Icarus in Flight. These stamps were issued in miniature sheets of eight. The 1.40 F. + 60 C. denomination Pro Aero Air Mail stamp shown above (Zu. F #49, Mi. #1369, Sc. #B541) was issued on March 8, 1988 to commemorate the 50th Anniversary of the Pro Aero Foundation. The design features a Junkers JU-52 of 1939 flying past the Matterhorn. These stamps were issued in miniature sheets of eight.